Your Vote Matters was one of several initiatives led by Center for Leadership and Service and Student Government Association in the fall of 2016. Pictured, from L-R: Christopher Johnson, senior information technology major; Robert Castillo; Nannette Boza, senior international relations major; and Jordan Thompson, senior political science major. 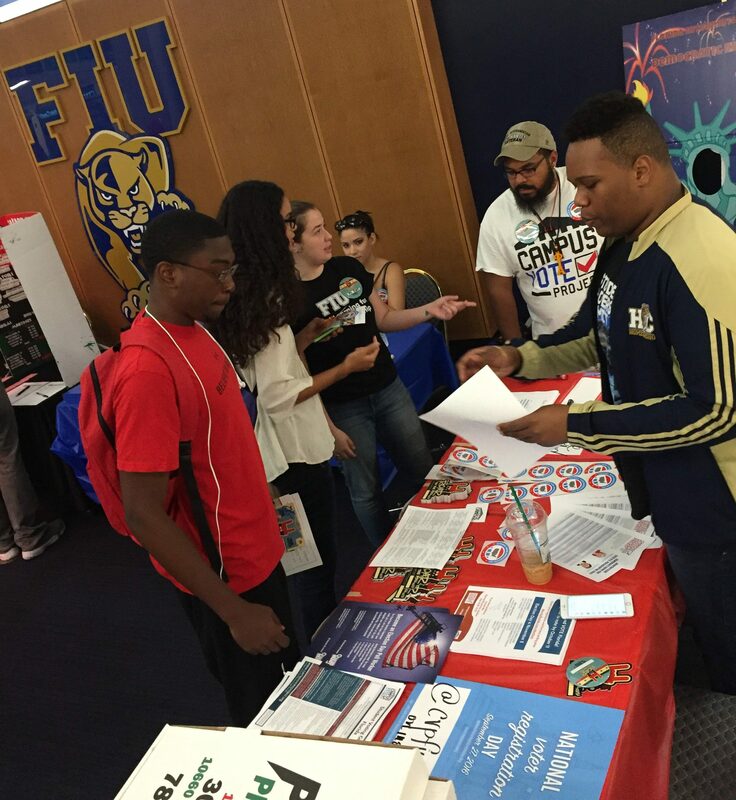 FIU was recently named one of 83 campuses – and one of just six schools in Florida – designated as a “Voter-Friendly Campus.” The initiative, led by national nonpartisan organizations Campus Vote Project (CVP) and NASPA – Student Affairs Administrators in Higher Education, held participating institutions accountable for planning and implementing practices that encourage their students to register and vote in the 2016 general election and in the coming years. During the fall semester, the Center for Leadership and Service collaborated with the Student Government Association (SGA) to develop democratic engagement among students. According to Nashira Williams, assistant director at the Center for Leadership and Service, partnerships with SGA, the Miami-Dade Election Commissions, Global Learning and Student Conduct and Conflict Resolution were critical to ensuring students had an opportunity to learn about the democratic process and register to vote. The department also engaged two fellows to work on programming, which included 13 campus events and a pledge to vote campaign. The teams also collaborated to bring the ONE Vote Caravan to campus. The event raised awareness about poverty and how students can lobby elected officials to solve the social issue. Even Miami Football Club player Mike Lahoud got in on the fun. The partnership also spurred a Rock the Debate mock debate, where students from the FIU chapter of Toastmasters embodied the candidates that were running for office with scripts and predetermined questions. The activity engaged participants in understanding the issues and candidates who were running for office. Student Government Association hosted events in the Pit to educate students about how to register to vote and provided resources to learn about candidates. Other events also included Roar to the Polls, a series of events that covered topics like voter literacy, voter myth busters and a celebration on Voter Appreciation Day. In another initiative, students from the Honors College marched to a voting station to cast their votes. 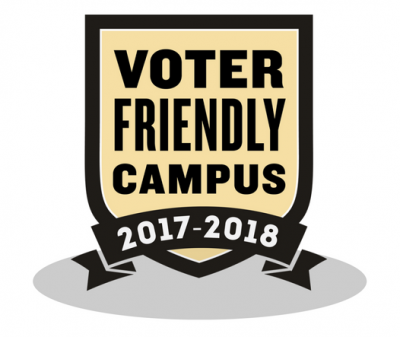 The mission of the Voter Friendly Campus designation is to bolster efforts that help students overcome barriers to participating in the political process. 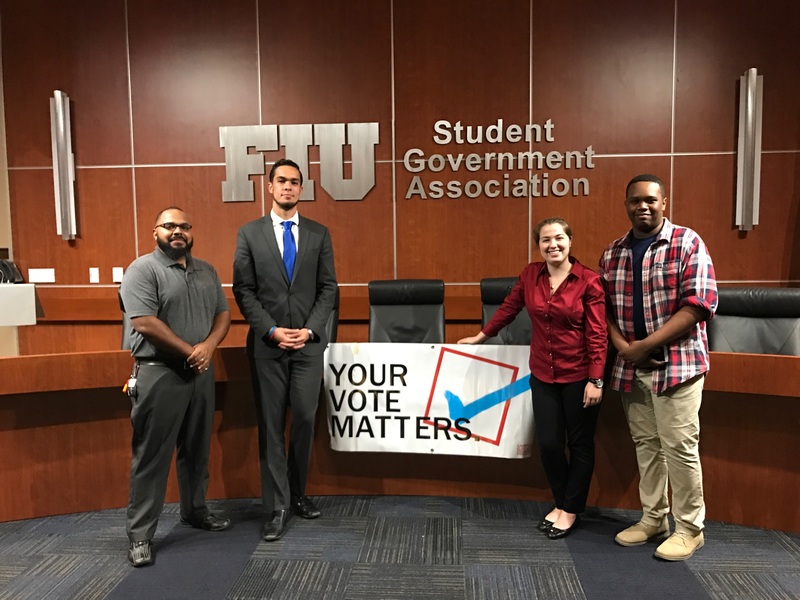 FIU was evaluated based on a campus plan about how to engage student voters in the fall of 2016, facilitation of voter engagement efforts on-campus and a final analysis of all efforts. The designation is valid through December 2018.